About Roofing Supplies – the people behind the name. Many companies go to great lengths to promote themselves as ‘family businesses’ that value their staff and customers. The feedback on our website and elsewhere reflects how much we value our customers and our successful approach to customer service. However, we value our staff as well: We have a policy of training and developing all of our staff, giving each team member the opportunity to develop as individuals and within the company. At About Roofing Supplies we really are a family company – our three directors (two of whom are brothers) founded and still own the company (no faceless shareholders here! ), and are based and work at the branches. They believe that our staff are our greatest asset and that individuals should be given chances to grow and develop and to reach their potential. Since we started trading nearly twenty years ago, many staff who joined have stayed: myself and two colleagues will shortly be celebrating our fifteen year anniversaries, and we are by no means the longest serving! Because we value our staff and train and develop them, not only do they stay with us – which gives us consistency and experience, unlike many of our competitors - it results in a better service for our customers, many of whom get to know our staff and value dealing with ‘real people’ on an ongoing basis who know them as individuals, not just as 'another' customer. One of our drivers, Gary, is a recent example of this: Gary joined us in 2016 as an experienced van driver, to drive one of the smaller vehicles in our fleet. Gary immediately shone as a concientous individual, and was popular with our customers, whilst completing his deliveries promptly and efficiently. He expressed an interest in progressing his career and skills, and driving one of our 18 ton crane lorries – driving an £85,000 vehicle on the busy roads of the South East is a big responsibility, and one not to be taken lightly. However, Gary was keen and we felt that he was an ideal individual to invest in. 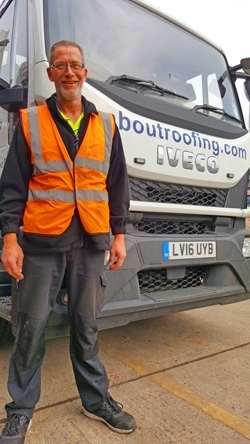 About Roofing Supplies funded Gary’s HGV training, his advanced CPC training and his HIAB crane training (which represents a significant investment by the company in him as an individual) and he passed his tests earlier this month, and having had a period when he was accompanied by one of our Transport Managers, is now out driving one of our fleet – perhaps delivering to your site! Another of our drivers, Steve, is having HGV training currently, and we are confident that he too will be out delivering on another of our crane lorries soon. In fact, of our HGV driving team, the only drivers who have not been trained at About Roofing Supplies’ expense are two individuals who learnt to drive whilst serving in the Army. Similar tales of investment and advancement can be told by all of the members of our Management team, our Accounts team – even our yard team have opportunities to advance: a number of them have progressed into either the driving or sales teams over the years.